Kapinga Camp is situated in the extreme northwest corner of Kafue National Park, in an area called the Busanga Plains. Kafue is one of the largest national parks in Africa, while the Busanga Plains is one of Zambia's most significant wetland resources and one of the few areas in the world that remains unspoiled by human development. Wilderness Safaris owns and manages Kapinga Camp. Tents and the main area are all shaded by a canopy of majestic trees and on raised wooden platforms to enhance the panoramic view across the plains. Lively colours and stripes characterise the main area, comprising a lounge, dining area, camp fire and small pool under a shady tree. · All have twin beds but can be converted to doubles if need be. · 4 Meru-style tents - Facilities are en suite and include an indoor and outdoor shower. · Dining and bar area are under a canopy of majestic trees. · Dinners served in a traditional style boma under the stars, overlooking the Busanga Floodplains or indoors. · Electricity is supplied by a small diesel generator which runs for a short period of the day while guests are out on activities. The energy is stored in a bank of batteries and this provides for lighting in the evening. · Potable water to the camp comes from a well. · Overhead fans have 24-hour power; guests need to be conservative with the use of all electrical equipment. There are no child restrictions at Kapinga. Same-day laundry facility is included. Guests can take part in game drives in and around the plains, while night drives offer the added excitement of the nocturnal wonders of the area. All activities are led by qualified guides, who are extremely knowledgeable about the area and its wildlife. Kapinga camp is perfectly situated to see large numbers of plains game and their predators, including leopards, wild dogs, cheetah and prides of lion up to 20 strong. Boat trips on "Banana Boats" on one of the deeper rivers can be arranged dependant on itinerary; this is a full-day activity with a picnic lunch and drinks. At 22 500 square kilometres, Kafue National Park is one of the largest National Parks in Africa. It is fed by three rivers, the Lufupa in the north-west and the Lunga and Kafue in the north-east. The Lufupa River floods in the summer, creating a large floodplain delta system that attracts thousands of waterbirds. The Lunga and Kafue rivers are wide and slow-flowing, banded by riverine forest. In the extreme north of the Kafue lie the Busanga Plains - one of Zambia's most significant wetland resources and one of the few areas in the world that remain untouched by development and human activity. Considered the jewel in the Kafue crown, the Plains cover an area of approximately 750 square kilometres with Busanga Bush Camp centrally situated within this breathtaking wilderness. The Plains are home to hundreds of red lechwe, ubiquitous puku, stately roan and the diminutive oribi. Lichtenstein's hartebeest, herds of wildebeest, zebra, buffalo and Defassa waterbuck are often seen, while hippo come out of their deep-water channels to graze. This wealth of game on the plains is also a big attraction for predators, including wild dog packs, lone cheetah and lion prides. Pangolin and caracal are spotted occasionally. The Park has the largest mammal species diversity in Zambia due to its interesting habitat mix which includes miombo woodland and seasonal open grassy areas called dambos. The Park boasts 55 large mammal species - including 20 ungulate and six cat species! 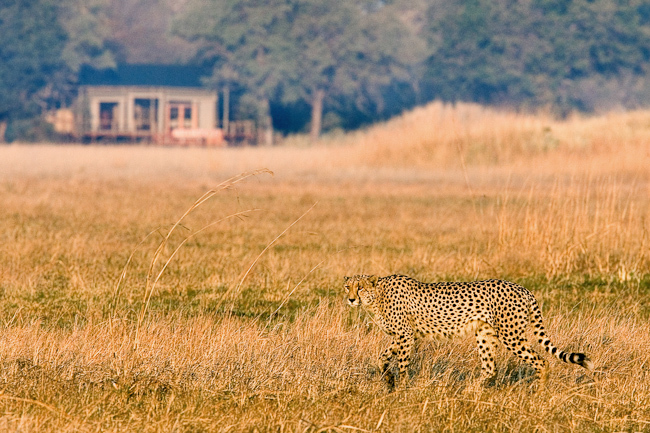 At Busanga Bush Camp other unusual sightings include leopard, porcupine, water mongoose and side-striped jackal. The birdlife is thrilling in its diversity and numbers with nearly 500 species recorded, including exciting endemics such as Chaplin's Barbet. The Busanga plays host to elegant Grey Crowned Cranes and Fülleborn's Longclaw is another speciality here. Birding habitats are exciting and include vast floodplains, broadleaved woodland (mopane and miombo), open water and riverine fringe. Other key species include Ross's Turaco, Schalow's Turaco, African Finfoot, Half-collared Kingfisher, Red-throated Twinspot, Böhm's Bee-eater, Black-backed Barbet, Brown Firefinch, Sooty Chat and Western Banded Snake-Eagle. The area is alive with rollers, bee-eaters, kingfishers, herons and large flocks of Open-billed and Yellow-billed Storks. Northern Kafue is also home to a myriad of other birds like Lesser Jacana, Spur-winged Geese, Saddle-billed Stork, Secretarybird and Martial Eagle to name but a few. As Wilderness Safaris has expanded its presence in Zambia in the Kafue National Park, more opportunities have arisen to partner with the local people in caring for and learning about our environment. Employment opportunities have been the first step in this process; initially in construction as more than 150 casual labourers from remote surrounding villages helped to build the new camps, and then later in the open camps where upwards of 130 men and women are permanently employed in ecotourism positions. With permanent employment has come training and skills development. Rural income is such that those employed in the 5-month construction period earned more than 8 times the annual average income for rural Zambians. Further projects are on the cards with the next major focus being education. Children in the Wilderness (Zambia) hosted its first group of school children in 2007. Wilderness Safaris' Zambia camps, including Busanga Bush Camp, have pioneered the use of innovative energy-saving systems, which are being used as a model to lower the environmental footprint across the entire portfolio of Wilderness Safaris camps in all regions. Given their relatively recent presence in Kafue, Wilderness' conservation efforts here have been limited to date. Crucially they have established a year-round presence in the remote areas of the Park. Prior to their presence, poaching was known to occur especially in the wet season when the area is largely inaccessible and visitor activity is low. Kafue saw significant poaching in the 1980s and game numbers declined before beginning to recover in the 1990s with the growth of ecotourism in Zambia. Today in Kafue Wilderness Safaris permanently employ eight game scouts seconded from the Zambian Wildlife Authority who are based at their camps and conduct anti-poaching patrols from these bases year round. Additional measures taken in Kafue National Park have been the secondment of a tertiary student who, aside from learning skills useful in the ecotourism industry, has conducted grass surveys of the Busanga Plains and examined the role of fire in this unique ecosystem, so contributing to the understanding and thus management of it. Further fish surveys are planned with future students in an ongoing capacity building programme in order to determine the role of traditional fishing in the area. An aerial census conducted in September 2007 has provided baseline data of the ungulate population of the Busanga Plains that is useful in comparison to figures from the 1970s; these calculations will allow them to chart the ongoing revival of the area.